Just like many motivational books, this one’s title promises a lot. But then again it is a good title as long as it catches your eyes and makes you want to buy it and read it in hopes that it will keep up with its promises. 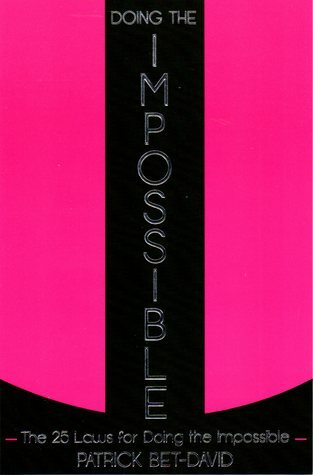 This little, easy to read book is divided into 25 chapters or “laws”, as the author calls them, for doing the impossible. Chapter by chapter the author emphasizes what is important to do in life or change in yourself to achieve your impossible goal. These steps are things like: be around the right people, work a lot, challenge the way you think and your imagination, go beyond your limits, aim high, don’t lose faith, be brave etc. The chapters are short, synthetized advice together with some insights into the author’s life in order to prove a point and maybe motivate you further more. Also, each chapter has exercises like “Name three habits you have that were of use to you in your life.” or “Name three bad habits that you could give up in order to become a new person.” All this, in order to help you assimilate that information and maybe gain some insight about yourself and what motivates you in doing certain things. I’ll be honest. I read better motivational books than this. Although they were more detailed with what they preached. Maybe this is a version for the busy individual who can’t waste time reading much and wants the summary of things. This book also seemed like a collection of blog posts or internet articles that you can find at a few clicks distance. But it served as a good reminder of things I already read in other books.